Fit After Fifty: How to Lose Weight, Get Fit, and Stay Fit For Life will help you change your life. In this book you will meet normal everyday guys, just like yourself, who for one reason or another, were able to change their lives. For some of them the defining moment was a wake-up call, landing in the Emergency Room having a heart attack, or struggling with chest pains. For others, it was finally deciding that they had enough of being overweight and sore and huffing and puffing up and downstairs and across parking lots. At age 51, Bill's job was eliminated. He weighed 355 pounds, and decided it was time for a change. Over the next year he lost 107 pounds, and dropped 10 pants sizes. Tom just turned 50, and one of the things he noticed was his workouts lacked the intensity they used to have. He was also starting to pack on weight around his waist, where he once had washboard abs. Unable to change things on his own, Tom enlisted the help of a personal trainer, and with his direction has been starting to some changes for the better. Discover why you need to stay fit! Aging can make it seem like your body is launching a multi-pronged attack against you. You know that feeling you get when you've been under siege by the flu for the last 72 hours. Aging can literally take you through the wringer just like that, and leave you feeling drained and lifeless. Staying fit can stop, or prevent all of this from happening. You need to assemble a team of advisors who can help you reach your goals. These are the people who will help you develop your plan and put it into action. Together they can help and encourage you over all of the speed bumps that you may encounter. Don't wait another minute. Order your copy of this book today! It will change your life. Waste of time for me. Very disappointing as it was geared toward men. From every study I've read, it is much more difficult for women to lose weight after fifty than for men. When my husband and I follow what's recommended in this book, he loses a bunch of weight, I lose a small amount. If I had known it was geared toward men, I wouldn't have purchased it. 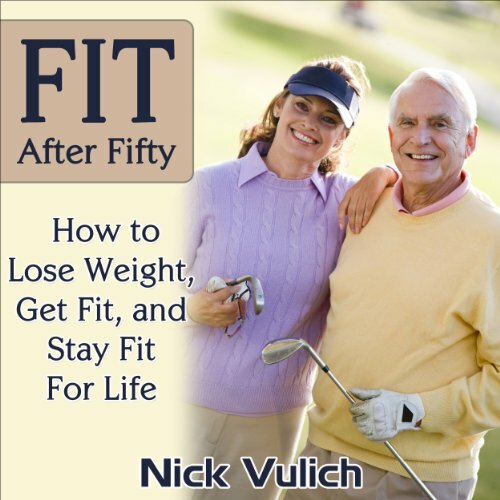 Was Fit After Fifty: How to Lose Weight, Get Fit, and Stay Fit for Life worth the listening time? Please put in the description that all the examples are of men that lose weight and get fit.